Oh my goodness readers! 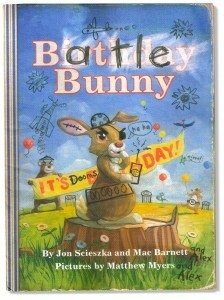 I am so excited to write this blog post about a new book called Battle Bunny by Jon Scieszka and Mac Barnett with pictures by Matthew Myers. Where to start with this amazing new book? What appears to be a lovely picture book about a precious bunny who is celebrating his special birthday, is actually an action packed adventure of a full on action hero bunny! I know what you are thinking. An action hero bunny? Think the Easter Bunny in Rise of the Guardians when he was a young whipper snapper! All throughout the book, 10 year old Alex highjacks this serene and happy tale by writing over the typeface and altering the pictures with what appears to be a black crayon or pencil? He rewrites the words to show his version of the story that is action packed and full of hare raising shenanigans! I know that young readers will thoroughly enjoy this brazen rewrite and boldly illustrated new picture book! The laughs and fun will be had over and over again! 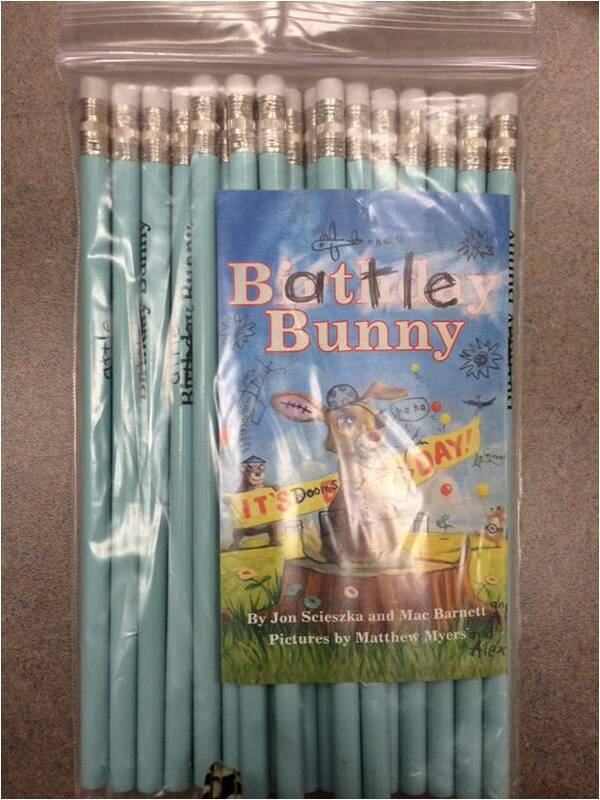 The first 18 RBE Library Readers to comment on this post about how excited you are to read the book will get a Battle Bunny pencil! I am so excited to read this book!It looks action packed! This book looks awesome!! !I really want to read it! I really want to read this book.I know its about a bunny and I love bunnys.I also want to read it because its cool that the book appears to be about the rabbits birthday, but it is about a action hero bunny. I think you will love it too! Pencil for you! I can’t wait to read this book! I think it is going to be AWESOME! It looks awesome. I mean a battling bunny? I want to read it. I can’t wait to read it i’m hooked so much! I can’t wait for it to come out! I really want to read this book!!!!! !I think this book will be awesome and weird at the same time!!!!!!!!!! Oh my gosh!! Its looks so awesome and neat. I love action in books. I can’t wait to read it!!! I wish i can a a preview of the pictures. They must be really unique! I really want to read this book!!! I love bunnies! Wow! what an amazing book! Battle Bunny is epic! You have to read this book! i can’t wait to read this amazing book. I think bunnt books are really intresting. I hope i will get a chance to read it. This book by the way is a battle between me to see how i make my choice.I hope i will see this book in the libary eventully. I can’t wait to read this book! I think it is going to be AWESOME! P.S I forgot one more thing This book is so action and very very very funny!! I can not wait to read this book Because when I look at it I can tell that it looks funny. I have read a book called lion vs rabbit.It was very funny because there was a lot of bunnies. The Battle Bunny cover is such intresting! I am very excited to take a veiw at this awesome book. I feel like I must check it out the RBE Library! I know myself; I LOVE reading. Its like as soon as I see a book like Battle Bunny, I would read it for sure! I hope you really enjoyed the book! say without the pencil marks “Birthday Bunny”? Readers! 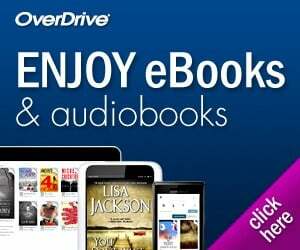 Thank you all for being such great digital citizens and readers! It’s so fun sharing good books with you and seeing your excitement about a new RBE Library book! I can’t wait to read this book. It looks like it is going to be very funny, interesting, and adventurous. I love reading and this seems to be the perfect book for me!!!!!!!! I can’t wait to read this book! I mean a battling bunny on his birthday!!!!! !